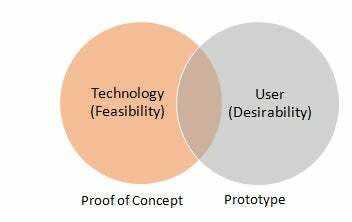 What is the Difference between Proof of Concept and Prototype ? A prototype has almost all the functionalities of the end product, but will generally not be as efficient, artistically designed, or durable. We frequently come across the terms “Proof of Concept” & “Prototype” and often they are interchangeably used, even though these terms have a clear difference. The terms mean different things and have different functions. During a lifecycle of an initiative a product/project will fall under these categories and to successfully implement technology it is imperative for the product to go through this transformation. A Proof of Concept (POC) is a small exercise to test the design idea or assumption. The main purpose of developing a POC is to demonstrate the functionality and to verify a certain concept or theory that can be achieved in development. Prototyping is a valuable exercise that allows the innovator to visualize how the product will function, it is a working interactive model of the end product that gives an idea of the design, navigation and layout. While a POC shows that a product or feature can be developed, a prototype shows How it will be developed. While a POC is designed purely to verify the functionality of a single or a set of concepts to be unified into other systems. The usability of it the real world is not even taken into consideration when creating a proof of concept because integration with technologies is not only time-consuming, but also might weaken the ability to determine if the principle concept is viable. This exercise is to identify the product features before jumping into development. A prototype is a first attempt at making a working model that might be real-world usable. Things go wrong in the process, but identifying these errors and stumbling blocks is principle purpose of building a prototype. A prototype has almost all the functionalities of the end product, but will generally not be as efficient, artistically designed, or durable. The POC method allows sharing internal knowledge among the team, explore emerging technologies, and provide an evidence of concept to the client for their product. First, the developer assigned to the POC conducts research and begins to develop the feature with the goal of proving that it’s feasible. Once this is proven, the POC is extended to develop an integrated working model to provide a snippet of the final product. After that it’s either presented to the client and the product team to sell the idea for an upcoming project or it can be used internally within the development teams to share knowledge and stimulate innovation. Prototyping is a quick and effective way of bringing a client’s ideas to life and serves a sample for the potential users to evaluate, test and share their feedback to make improvements. This technique also helps in documentation and provides the team with a more accurate estimation how long it will take to complete. In some cases, a POC maybe a simple research that would further lead to a concept of the upcoming project, or a more complex concept such as a mobile app checkout feature. The final POC does not have to be bug-free but should ultimately show the functionality of the concept. In conclusion, proof of concept says that it can be developed and validates the technical feasibility whereas and a prototype shows a potentially buggy, unrefined attempt at the final product. However, you still need that all-powerful customer to determine the success of your product.